It’s the year 2044, and thanks to a series of devastating solar storms, the world’s population has been slashed to only 22 million, most of whom are confined to the sunbaked shell of a former metropolis. Forced to rely on 1990s-era technology for their communication systems, society has nonetheless benefitted from the creation of a series of robots, the Autómata Pilgrim 7000, meant to serve and protect humans. Produced by the ROC Corporation, these robots are programmed with two strict protocols: they cannot harm any living being, and they are unable to alter themselves or other robots. Jacq Vaucan (Antonio Banderas), one of ROC Corp’s insurance investigators, is too burned out on his job to realize there is a problem with the Autómata, even as he checks out a claim filed after a robot kills a family’s loyal little dog. But soon he’s in a laboratory looking at a second Autómata, one shot by a police officer (Dylan McDermott) who swears he saw the robot repairing itself. All the scientists chuckle, sure the officer was either mistaken or high, but finally Jacq gets it through his world-weary head: something has gone very wrong. 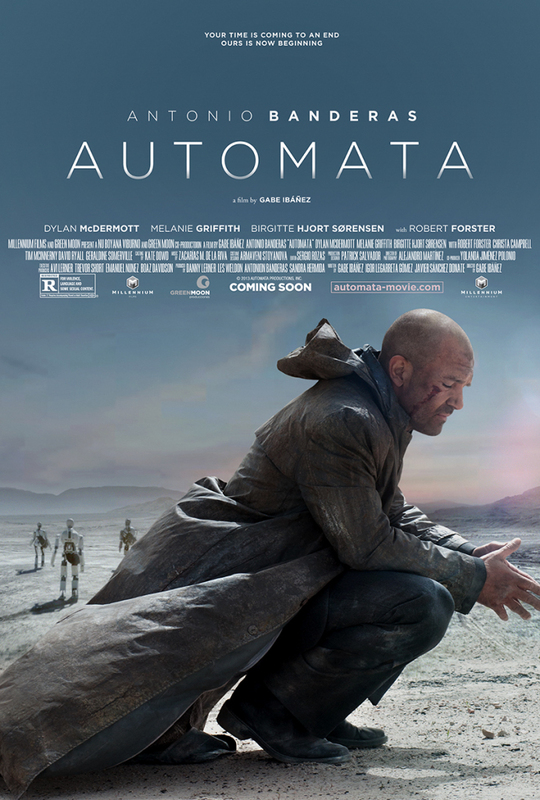 Autómata, the science fiction thriller from Gabe Ibáñez, is a striking film that boasts impressive visuals and special effects. It’s also a film that has the good sense to acknowledge the inevitable Blade Runner (1982) comparisons almost immediately, though doesn’t limit itself to a single homage, instead grabbing all the tropes it can, whether science fiction or crime procedural or film noir, and stuffing them into the script. Early on, these feel like acknowledgements of the film’s cinematic roots, but soon Autómata is overflowing with bits borrowed from other works, and little of its own identity remains. Banderas does most of the heavy lifting in Autómata, his existential exhaustion both compelling and photogenic, his humanity hitting all the right notes. There are moments, however, where editing undermines his performance, most notably toward the finale, during what should be a touching scene between man and his metallic mate. The pathos Banderas injects is overridden by the filmmakers’ strange decision to focus on the silly antics of the former sexbot the investigator has found himself alone with; bittersweet may have been the intent, but camp was the result. Even solid performances from stalwart character actors like Robert Forster and Tim McInnerny who, along with Melanie Griffith as the underground scientist able to modify the Autómata, can’t rescue the film in the back half, where things become so disjointed that one suspects important moments ended up on the editing room floor. The rest of the film’s problems can be summed up as simple lack of attention. Take Cleo (voiced by Melanie Griffith), an Autómata who has been modified twice: first, as a sexbot, then later fitted with one of the biokernels from one of those mystery robots found repairing itself. She has seen humans kill each other, even rescued a man from a band of murderous henchmen, but later, in what is supposed to be a very moving moment after an attack on Jacq, says with soft-spoken robot wistfulness that she never knew humans could hurt each other. It’s not that Autómata is a clumsy film; rather, it’s so well structured in the first half that its collapse toward the finale is shocking. There has been careful, thoughtful construction of the world in Autómata, and a build-up toward what should have been a marvelous payoff. Even the pointless, early deaths of some main players point toward a parallel with the ease at which corporations dispense with the inconvenient citizenry, and the way humans dispense with their robot servants, too. There’s a lovely futuristic, gritty noir feel, and as a crime thriller, Autómata succeeds. It’s when the thriller ends and the philosophical questions begin that things go awry. Realizations aren’t had, connections aren’t made, and the energy seeps out of what could have been a fine film.